Most of the tarantulas available for sale to breed as pets are of medium or big size, but there are a few ones which, despite their tiny size, can be impressive and extravagant. 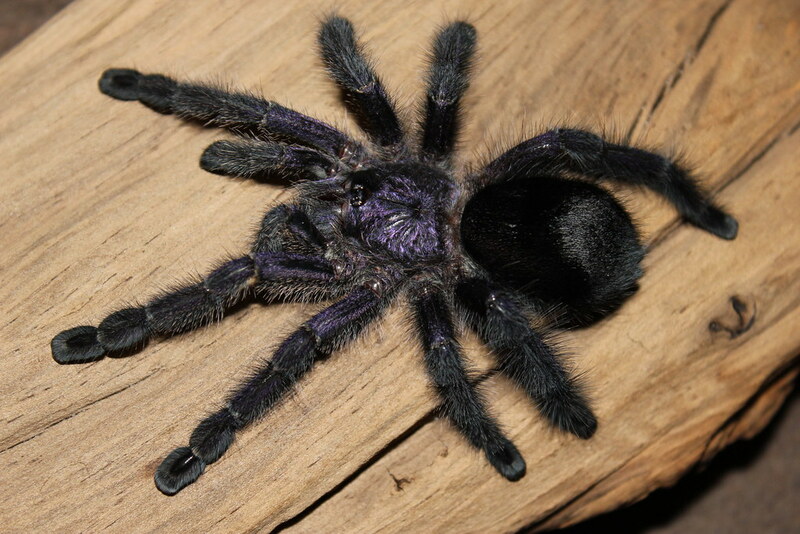 This time, we’d like to introduce you to the Avicularia purpurea, commonly known as the Purple Pinktoe Tarantula. The A. purpurea comes from Ecuador, this is a versatile species, meaning that they can survive in several different types of environment, but they are more commonly found in places where agricultural activities are being done. When in the wild, they like to live in the holes of the trees. These little tarantulas can have a size of maximum 5cm in females and 3 or 4cms in males, and the fact that they’re an arboreal species makes them a bit difficult to have as pets if you’re a beginner. This tarantula might look cute and exciting, but that doesn’t mean that they’re easy to handle. The most noticeable thing in avicularia purpurea is their purple coloration, which can differ from different shades of that color and some shades of blue, and obviously, the soft pink that they usually have around the legs. If you’re an experienced tarantula breeder or at least have some experience handling arboreal species, this will be an exciting and cute addition to your house. As said before, they’re a tiny-sized tarantula, meaning that they can’t grow more than 5cms. As usual, the females are a bit bigger than the males, but the difference isn’t that much, as the males are only 1 centimeter tinier than the females. The lifespan of this species is usually around 12 years for females, and about four years for males; they don’t have as much longevity as many other spider species, but that doesn’t make them a bad option to have as pets, though. There is no much difference between the females and the males; they’re practically the same kind of spider except for their noticeable size difference. As previously mentioned, the Purple Pinktoe Tarantula is an arboreal species, so you can expect them to be excellent climbers and fast escapers. Their nature is to escape from almost anything they consider a danger (or even if it isn’t, they actually do that) so this is a species that isn’t recommended to beginners. There are more species in the Avicularia who have similar characteristics but other attitudes; if you think that you can’t handle this tarantula’s escapism, then you should consider getting another one as a pet. 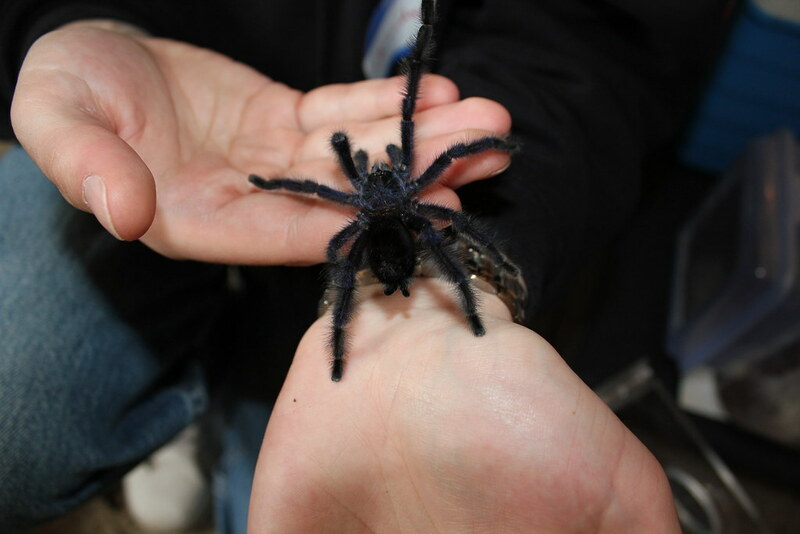 As mentioned above, handling them isn’t a brilliant idea if you do not have enough experience handling arboreal species (or tarantulas in general), so if this is your first time getting one, you should reconsider your selection since they can be tough to handle. Adding that they have a tiny size, you wouldn’t want them to get lost around your house after buying one! It’s better to avoid all those things happening. As usual, the venom of this species isn’t really dangerous to humans unless you have an allergy, so, besides the typical symptoms of the bite, you don’t have to worry about anything else. Despite that, they can throw urticating hairs as a way to defend themselves from danger; it’s better to leave them alone if you feel like they are getting aggressive. You can easily feed them with cockroaches and crickets, but they won’t get too picky about what you give them so you can feed them with different insects once in a while, such as mealworms, for example. The spiderlings can be fed with smaller insects, such as pinhead crickets. They do not require too much space, but you should provide enough so they can move freely without any problem. Since they like to hide in tree holes, you should provide something that mimics this so they can feel at home. Water is a must all the time, so be sure that they have easy access to it in the cage. There are many individual cages that you can get for arboreal species, but since this is a very tiny tarantula, the perfect size can be of around 25x25x35cm. Provide enough space so they can climb and walk around the place without any problem, after all, we’re talking about a very active kind of tarantula. As said above, they’re very active. They can survive using different set-ups for the temperature, starting from 72°F to a hotter temperature of 46°F. Despite that, it is highly recommended to keep a temperature of around 75°F during the day and to lower it about 40-41°F during the night to avoid any problems. The set-up for the humidity should be of around 65/70%. As mentioned above, there is no other difference between the sexes except for the size (males are tinier than females). During the copulation, the females can get very aggressive. With a good temperature and humidity, the mating should happen without any problem; after around two months (or less); the female will lay a cocoon in which you can expect from 80 to 150 eggs. An exciting option if you’re thinking of getting a new tarantula around your house. However, despite their strange look, you should consider that this is an animal that can escape easily, so you shouldn’t have one if you think that you can’t handle it or you do not have enough experience handling tarantulas. Besides that, they’re a very accessible kind of tarantula to expert breeders. • They have excellent adaptability, the climate can be adjusted according to your needs, and you won’t notice any difference in their behavior. Unless you want to make things perfect for them to produce some spiderlings, then you should set up temperature and humidity good enough for them to start mating. After the female’s first molting they will become sexually mature, but you should wait sometime before pairing her with a male because of what the aggressive behavior that we mentioned before. • Due to their tiny size, they don’t require a really big cage/habitat, so you can expect to find the perfect cage for you and your tarantula very quickly. You can decorate it in a way that your tarantula feels at home, providing spaces in which they can easily hide and move around during the hours that they’re active. Besides that, everything else that you’d like to get for it shouldn’t cause any problem. Do not exaggerate with the cage’s decoration, since we’re talking about handling an arboreal species and also a very tiny tarantula; you wouldn’t want to lose sight of them. • They shouldn’t case too much trouble if you set up the cage correctly, and if you want to grab them, as already mentioned, you should have enough experience since they’re very defensive and will consider almost anything or anyone that approaches them as a danger. Their bite isn’t really dangerous as mentioned above, but to avoid a painful and annoying sensation that can last a while (the urticating hairs), it’s better to leave them alone if you notice something strange going on.